Valuable in parties, Clerics are masters of healing magic. Clerics have a limited selection of attack spells and may also equip decent weapons. Clerics are well-rounded, much like Rangers. Clerics err slightly on the side of magic though, which is reflected by superior natural Intelligence and MP growth when compared to a Ranger. In spite of being limited to cloth armors, Clerics have the best natural physical defense of the four mage classes (Conjurer, Wizard and Warlock being the other three). They can be a fair shot with their weapon too if built for physical battle via appropriate equipment and skill point investment, although they will never be the equal of a similarly designed Ranger, Ninja, Merchant or Soldier. Clerics can equip Staves and Daggers. They are limited to Light Armor. In their Off-hand slot Clerics can equip Jewelry. 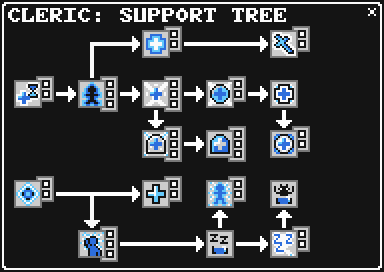 The Support Tree, as the name implies, is focused almost exclusively on healing or preventing damage. Goodnight and Nightmare are the only attacking options in this tree, allowing Clerics to support their group by incapacitating enemies, then dealing large amounts of single-target magical damage to them, although this uses a great deal of MP. As well, HealMost and the many Healing-oriented passive skills allow the Cleric to perform their class's primary role more effective, by healing off the damage taken by their party members in battle effectively, and with sufficient investment you can even make the more expensive skills such as Redeem and HealWave more practical to use in any fight. 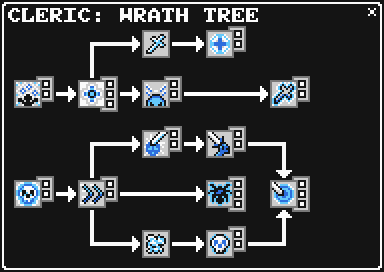 Compared to the Support Tree, the Wrath Tree is much more offense-oriented, which can seem somewhat odd. However, there are a number of skills that can be surprisingly useful to a Cleric who intends to spend less time healing, and more time preventing damage in the first place with their arsenal of instant-kill and poisonous abilities. Zeal can be used to recover MP from a successful Smite or Judgement, but the high cost and low default success rate of these skills makes it impractical to use reliably in combat. However, the Desecrate skill will also result in the Cleric recovering their magic power, which is a possibility that should not be taken lightly, due to its practicality in battles with many opponents. Failing that, the Cleric can instead opt towards a more Poison-oriented build, using Toxify, Contaminate, and Venomous Strikes to debilitate opponents and increase their own damage. Heal 5 1 Heals a single target for a low amount of HP. Smite 5 3 Inflicts direct damage on a single target: 10% base chance to instant kill. Detox 7 5 Removes the poison status from one ally. HealMore 12 7 Heals an ally for a moderate amount of HP. Poison 5 8 Chance to poison a single target. Sleep 4 9 50% base chance to put one enemy to sleep. Harden 10 12 Increases physical defense of one ally. HealWave 25 14 Heals all allies for a small amount of HP. Redeem 21 15 40% base chance to revive one ally from death. Soften 6 18 Lowers the defense of a single target. Dream 3 21 Awakens a sleeping ally and heals all allies. Has no effect if no ally is asleep. Sanity 14 25 Dispels the confuse status from all allies. HealMost 25 25 Heals an ally for a large amount of HP. Goodnight 17 15 30% base chance to sleep all enemies. Nightmare 12 25 Inflicts major damage on a sleeping target. Judgment 20 10 10% base chance to instant kill an enemy group. Toxify 9 10 40% base chance to poison an enemy group.